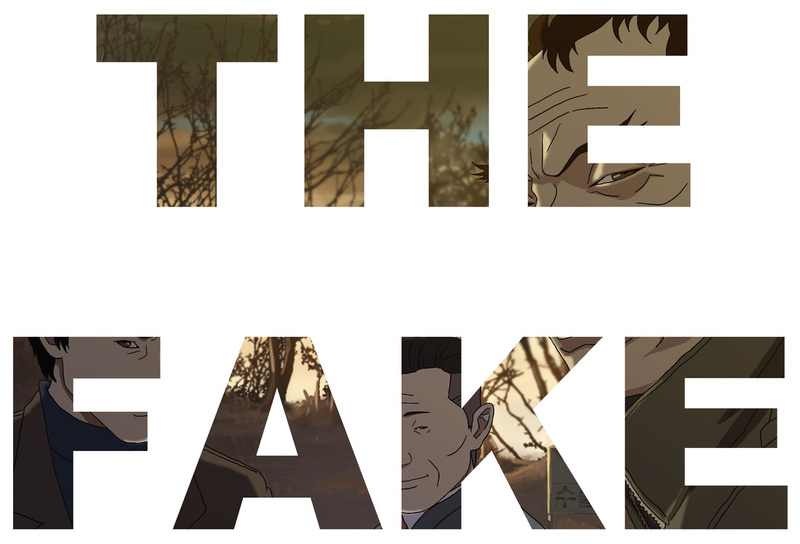 This article is a review of THE FAKE. Killing a dog with a hammer just off camera is not going to be in a Disney flick. 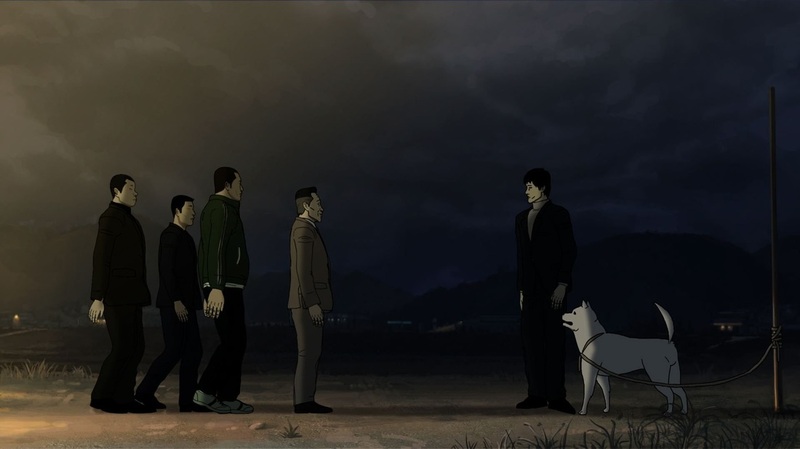 South Korean writer-director Yeon Sung-ho (THE KING OF PIGS) is not your normal animation filmmaker. 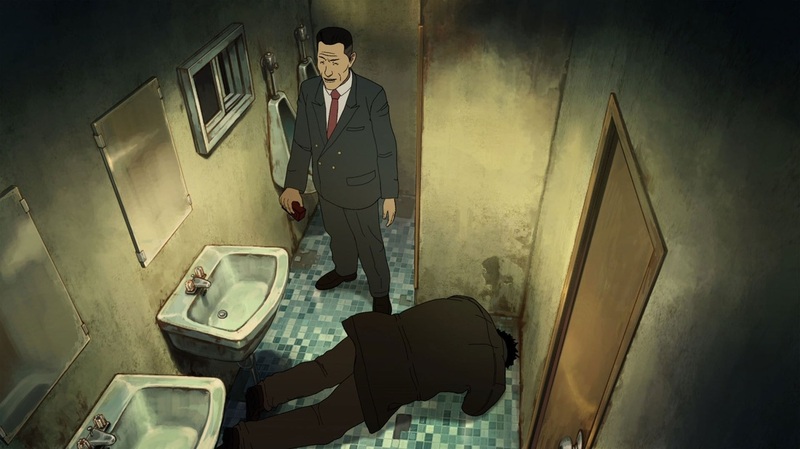 Hard-hitting, yet THE FAKE avoids the exploitative excesses of some animé. Pessimistic and misanthropic, there is a cataloguing of societal and individual failures to look after one another; more than that even, a look at conscienceless behaviour. Impending dam construction is about to flood a community. The last hangers on, compensation paid, linger. For what? A miracle perhaps? Dithering rabbit-in-the-head-lights freeze of movement? Nature abhors a vacuum (so says Aristotle). 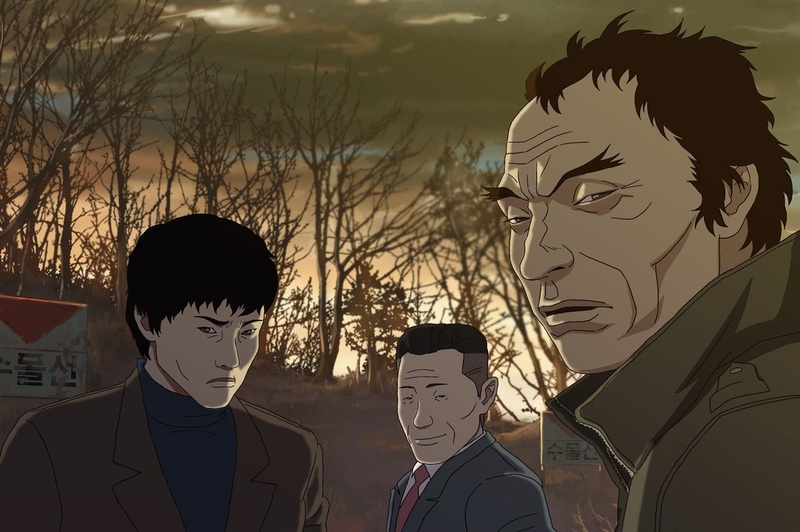 In comes a troupe of con artists, led by Elder Choi Gyeong-seok, using the genuine-seeming Reverend Chil-seong as a front. Promising only 144,000 places in heaven, with purchase the means of entry, gullibility/desperation cause a depressed village to begin haemorrhaging their savings. Ostensibly the cash will go towards the dream of building the Flower Hill prayer house. Of course, we know better, thanks to Choi earlier using a brick to put down Min-cheol, a vile loud-mouthed villager returning home. Min-cheol’s downtrodden wife is ineffectual at protecting their daughter, Young-seon, from him. 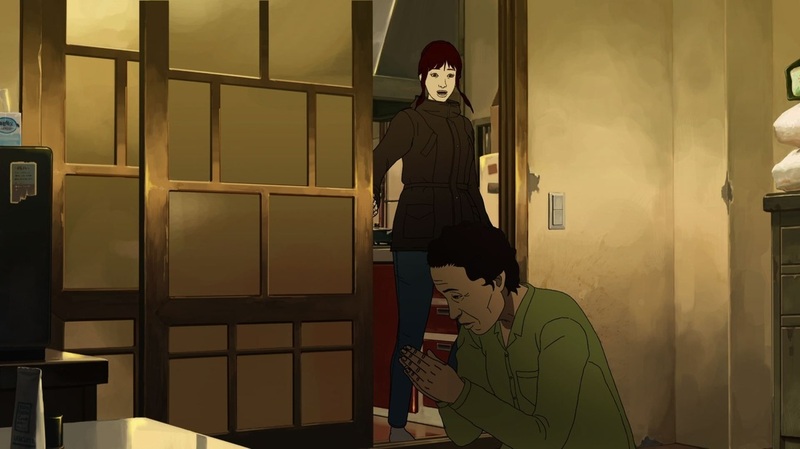 Physical chastisements actually appear, somehow, less drastic when Min-cheol breaks his daughter's spirit by stealing her money meant for university. 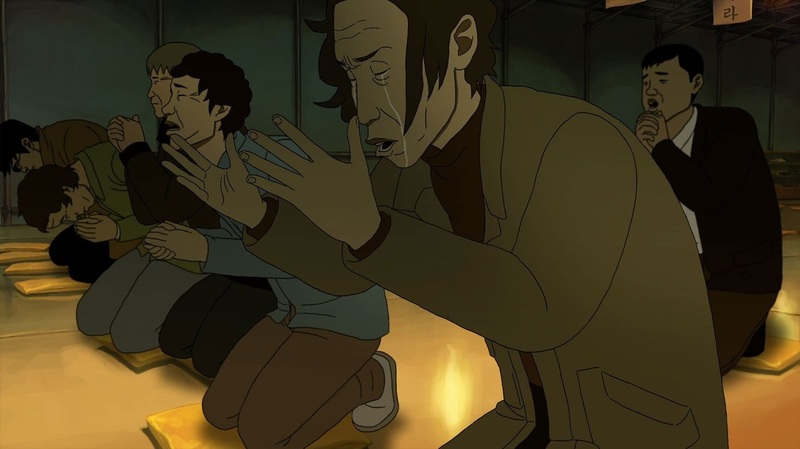 Anguish suffered by a cartoon character convincingly portrayed is a rare achievement (think Setsuko in GRAVE OF THE FIREFLIES or Carl Fredricksen in UP). Doubly jarring, and weirdly funny, is hearing the c-word dropped from animated lips, and the character of Min-cheol does not hold back. In the vain of THE WORLD OF KANAKO, having your lead be so abhorrent, yet be the sole voice of reason in a society gone to seed, is a bold, unapologetic move. Distaste has seeped into the frame, quickly relayed via the image of a centipede scuttling across a broken sign. 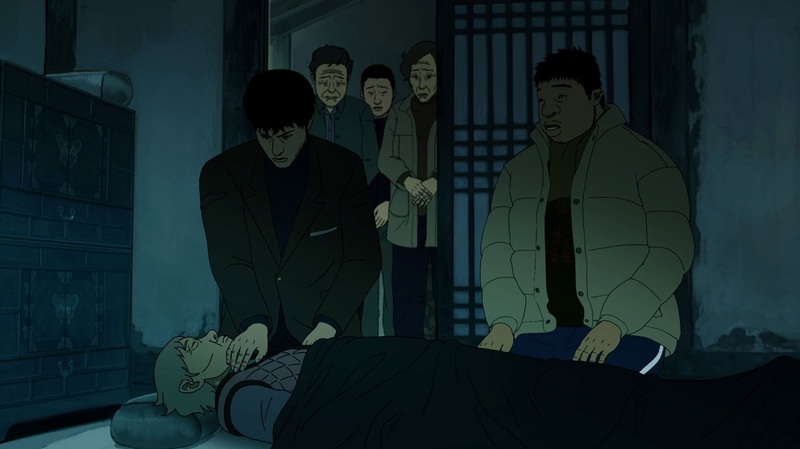 Adroitly, it is hard to tell whether director Yeon feels sympathy for his protagonists, or disdain. 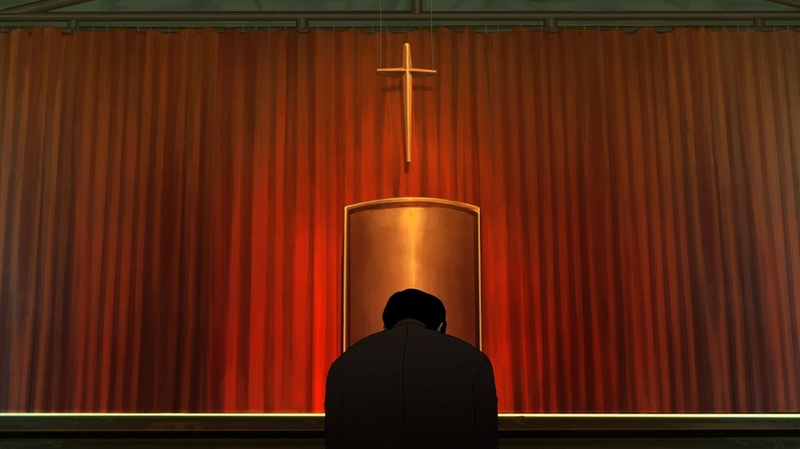 From pastoral revelations to mad-dog uncontrolled anger, THE FAKE is a place of pain. One stylish fisticuffs set-piece aside, the film is a steady build of human frailty until a character literally, and metaphorically, clambers into a hole. Is it of their own devising? Cathartic revenge-seekers, look elsewhere for simplistic answers. Dereliction of duty, exploitation, spirit breaking. Bleak stuff.